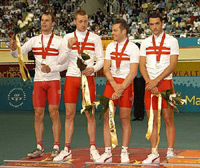 STILL seeking their first gold, England had high hopes of success in the team pursuit. But once again Australia reigned supreme. Their quartet achieved the holy grail of team pursuit racing - a sub four-minute ride - and a world record into the bargain. On a wet and dreary Manchester night, Graeme Brown, Peter Dawson, Mark Renshaw and Luke Roberts lit up the Velodrome with a ride of 3-59.583 for 4,000 metres, beating the old record of 3-59.710 held by Germany since Sydney 2000. England, the other finalists, were far from outclassed. Their 4-02.665 would have won most competitions. Defeat was a bitter pill for Bryan Steel, Paul Manning, Chris Newton and Bradley Wiggins. It was Wiggins' second silver in 24 hours. "I've been beaten now by two really world class rides and records, Brad McGee yesterday and these guys tonight," he said. "When you get beaten by a world record and those sort of rides you really cant be too disappointed." Asked what lessons could be learned from defeat, Wiggins said: "We need to get back on the road. That's the only way that we're going to be challenging for the top places - more road work, more track preparation." The Australian track squad has been based in Europe for most of the season, with the team pursuiters given a three-week build up. "We'd ridden together before, but our preparation for this Games was just a three-week get together," said Mark Renshaw. "I feel especially good about what happened tonight because at last year's Worlds we crashed and didn't even finish the qualifying round. Unfortunately the crash was my fault, so to make it up to the boys tonight and to get a world record into the bargain is unbelievable."